Water is responsible for triggering all natural chemical processes in bread dough. Water is the major constituent of all living matter. When pure, it is an odorless, tasteless, slightly compressible liquid oxide of hydrogen H2O which freezes at 0° C (32oF) and boils at 100° C (212oF), has a maximum density at 4°C (39.2oF) and a high specific heat. Water is a poor conductor of electricity, a good insulator and a good solvent. In baking, water usage originates from a local source providing tap water. Regardless of origin, it must be in drinkable form to be used in baking. 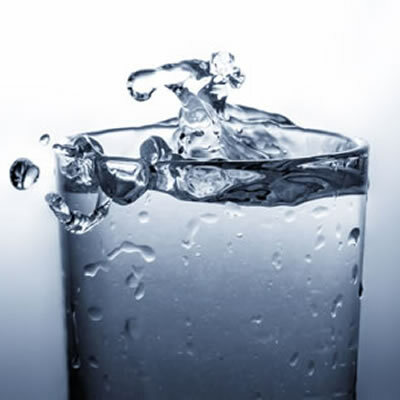 Water varies in mineral content, which contributes to the hardness of the water. The level of minerals makes it the challenging part of using water as an ingredient in baking – unless the bakery itself has a water softening system or similar control systems – to regulate the hardness of the water. Water is responsible for triggering all natural chemical processes in dough, controls dough temperature, and hydrates dough components. Specifically, water is one of the major components in baking, and thus many bakers use lower tempered water or use water to maintain the temperature of their batter or dough. First upon addition of water, starch particles are hydrated, dough is initially formed, and subsequently water molecules begin hydrating proteins that form gluten. Three distinct factors in the quality of a water sample have a vast impact on dough characteristics as well as final bread attributes. Taste, Chemical Content, and Mineral Content variations in water are the three factors crucial to aspects of baking. Calcium, Magnesium, and Sodium, in large or minute amounts, determines the hardness or softness of water. Minerals provide nutrients to the yeast; therefore, a change in mineral concentration will directly affect fermentation. A change in the fermentation will affect the dough characteristics, making it stronger or weaker. Hard Water: High mineral content. When used in baking, dough exhibits high strength and fast fermentation. Soft Water: Low mineral content. When used in baking, dough exhibits low strength and slow fermentation. May need yeast nutrients to improve fermentation. Dough development is challenging in the wide spectrum of baked goods, in response to utilizing soft and hard water. Water has a prominent effect on final product attributes. Cakes, pastries, and cookies, as well as tortillas or crackers, also react to water substantially. Want to know more about the water that feeds your bakery? Surf your watershed.